G is a kid at heart. OK, he acts like a kid most of the time. :) hehe love you sweetie! Since he rode the back of the grocery cart down to the car last night, its no surprise that he loves chicken fingers. I was originally inspired by this chicken nugget recipe from Bree, although my chicken fingers ended up to be pretty different. 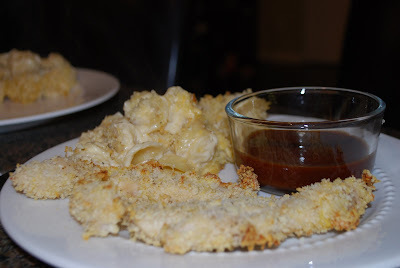 I then found this recipe and this recipe for baked chicken fingers- a lot more what I was looking for based on what was in my pantry. Based on some reviews from these, I came up with my own recipe. It's so easy! You can add whatever spices you like to change the flavor. What I love about these is how wholesome they are- 100% natural, organic chicken breast! Nothing sketchy a la the movie Food Inc. I used Panko (Japanese breadcrumbs) for an extra crispiness, but you could use regular breadcrumbs too. What makes these so perfectly crispy is baking them on a rack on top of a baking tray. By not letting the crumbs squish against the pan, you're maximizing the crispiness! Preheat oven to 400. Line a baking pan with foil. Place a wire rack on top and spray with nonstick cooking spray. 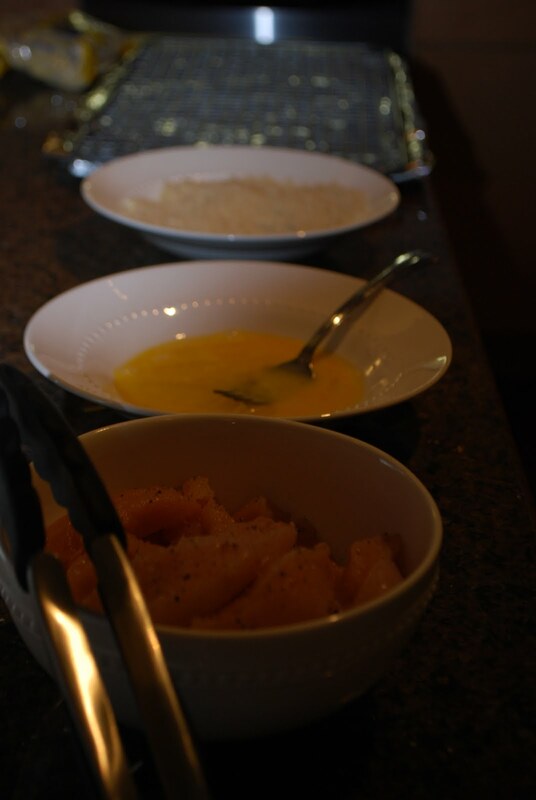 Season chicken with salt and pepper and set up your chicken assembly line. Bake for 12-13 minutes on each side, until golden-brown. 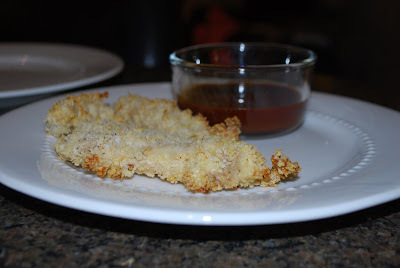 Serve with your favorite dipping sauce (mine is old-fashioned ketchup, but the bf only eats BBQ sauce). What suggestions do you have to make these even more delicious? What spices would you add? Mmm I actually made this again for dinner tonight! 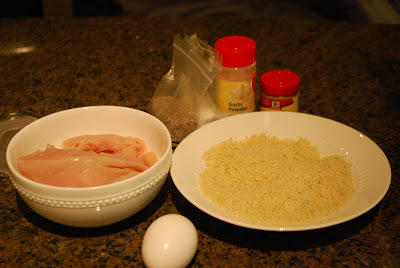 :) Added some Italian seasoning and paprika to the panko mixture and it was EXTRA tasty! 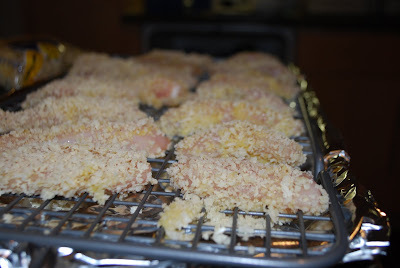 The secret is baking them on a wire rack (I use cookie cooling rack) over a baking pan- no squishy chicken! Also, the panko makes it extra crunchy! Let me know how it goes! Marissa, I finally made chicken fingers in the oven using the racks instead of putting them directly in the pan and I just wanted to thank you BIG TIME for that tip! It made a world of difference and turned a soggy failure into a delicious healthy dinner. The bf baked for me! Macaroni and Cheese - without the blues!